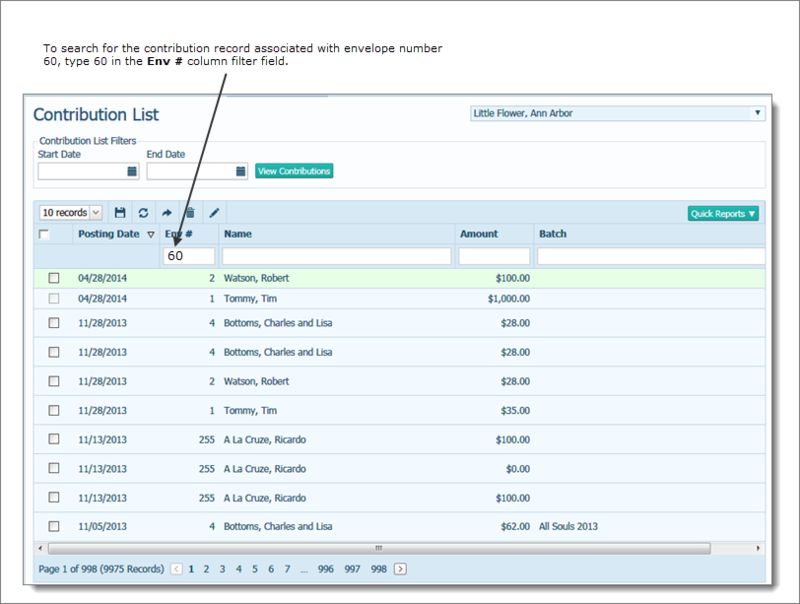 Only authorized users (those with View and Add/Edit access rights as well as permission to access the associated fund) can edit contribution records. If the batch containing the contribution is closed, you cannot edit the record. If the contribution is associated with a fund whose end date is in the past, you cannot edit the record. To learn how to extend the date, see the article How to edit a fund's details. The following instructions show how to edit a single contribution record. If you want to make the same change to multiple records, use the batch-edit feature, described in this article: How to Batch-Edit a Group of Contributions. Use the column heading filters to help locate the contribution you want to edit. For example, to locate the record by the donor's envelope number, type the envelope number in the Env # field. Note that a search returns both broad and exact matches for the value entered. For example, the value 60 returns 60 as an exact match plus other values that include the sequence 6-0, such as 601. Click the checkbox to the left of the record to edit and then the pencil edit button in the toolbar. The details from the donor's census record display at the top in the Donor Record section. This portion of the record cannot be edited here. Edit the details in the Contribution Record section as needed. An asterisk ( *) indicates required information. Note that for auditing purposes, you must supply a reason for any changes you make to a record. The Amount field accepts a negative value.